I leaned back against the door, hoping it would help block out the sound of the semi-truck, as it rumbled down the dirt road just beyond my front yard. “Whaaaaaah!” My babies cry told me it hadn’t worked. I lifted him from the crib, praying he’d go back to sleep. I hushed and bounced him, as I made my way to the rocker/ recliner at the back of the house. “It’s quieter here.” I thought. Still hopeful that naptime wasn’t over. The muscles in my legs strained to lift the footrest without making a sound. Just as his eyes started to close and I felt myself relax, the “thump, thump, bwah-thump” of the neighbors TV bass through the wall, made him pop his eyes open and signaled the official end of naptime. I wanted to scream. I wanted to pound on the wall and tell them to “TURN IT DOWN.” But it was 1:00 PM, and my TV was almost as loud as theirs… it wasn’t the neighbors, it was the duplex’s construction that was the problem. I wanted to scream, but I couldn’t. I watch in terror as one after another, they went over the edge. “Don’t they know? Can’t they think for themselves? Why do they just follow each other like that?” I asked myself, in that instant when you witness an accident and it stretches time into eternity. I couldn’t stop it. Sadly, I’d witnessed this before. I had screamed then. My screams could not stop them from going over the edge. They are lemmings. It comes natural to them. At least its my theory that it does. It must be genetic. Of course- my lemmings are not of the rodent type.. They are the sink/man/boy type. Fortunately, there has been no loss of life, as of yet, due to their mindless following. My men are sink lemmings. 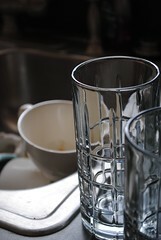 When they finish with a dish, glass or utensil, they take it to the sink. (We’ve made progress here, at least they head to the kitchen.) However, if there is ANYTHING in the sink. In. Their item, must follow. Right over the edge, along with my sanity. No, they do not check the dishwasher, to see if it is empty. They check the sink, to see if the dishwasher is empty. The problem is: pots and baking dishes, often have to be soaked after dinner so I can get them ready for the dishwasher. This does not mean the dishwasher is full. It means a pot needs to be soaked. My lemmings interpret this (and sometimes in the dark, a sponge in the sink.) as a sign of dishwasher fullness. Do you have lemmings at your house? Do you have a dishwasher if full/empty magnet- thing? Do you scream and yell? Introducing the “freecycle” method of de-cluttering. Holiday Ideas. The holidays will be here in no time… I don’t mean the season of the holidays… I mean the holiday party! I mean Christmas Eve. It will be HERE. At my house. In no time. Oh. my word. To be honest- I’ve also had a bag of clothes in my bedroom ready to be given away for months. I also have a box of books, ready to go. In my bedroom. Now- as I daily focus on an area to clean… I’m finding all kinds of useful (for others- not so much for us) stuff. Coats out-grown, shoes (who BUYS all these shoes, anyways?) too small, past season, stuff never opened- and no longer needed- or won’t be missed. Thus far- I’ve done pretty well at getting things ready to give away—but actually doing it? Well- that’s another story. (See the box of books and the bag of clothes mentioned above. ) Until now. I’ve found Free-cycle signed up for a local group, and now, all I have to do is send an e-mail – see who can use what I have- set up a time for pick-up and put it on the porch. ** Voila. What once was clutter- is now someone’s treasure. Free-cycle is a mom’s best friend- eliminates the waste of tossing usable items, meets the needs of those locally, and provides an easy OUT for the stuff that needs to go gracefully from our homes. I’ll admit- however- that my first pick-up has been a little stressful. I was flooded with requests for the offer, and hated to have to say it was already spoken for. There are also some pretty serious needs posted- and I could see one being quickly overwhelmed or feeling like you have to help everyone…..which is just plain not possible. The key will be remembering the legend of the starfish, and knowing that you make a difference to each one you help. Are you cleaning like a maniac? As you get ready for the holiday season- do you recognize how blessed you are- and want an avenue to help others? Do you have the “mom-rule” of cleaning out – giving away old toys before new ones can come in? I highly recommend Freecycle as a way to bless others with what you no longer need, or, with whatever you can cheerfully and generously give. ** if preferred- you can arrange other methods of delivery- I just like the ease of porch pick up. For me- generosity and giving- is all about Jesus and loving His people. Each one.